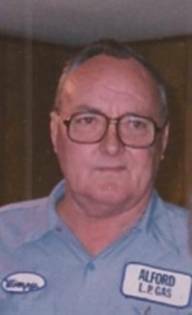 Winfred T. Wimpy Alford, 83, of Hull, was born on July 19, 1929. He was given the nickname Wimpy as a child and it became his name for life. After graduating from Hull-Daisetta in 1947, he attended El Dorado Jr. College in Kansas. As football captain, he crowned the homecoming queen, LaDonna Palmer, who became his wife in 1949. After moving back to the Hull-Daisetta area, Wimpy worked for Gulf States Utilities for 10 years. In 1964, he founded Alford L.P. Gas, working 45 years as a propane dealer until health concerns forced him to retired at the age of 80. Wimpy passed away on June 26, 2013 at Harbor Hospital of Southeast Texas in Beaumont. He is preceded in death by his parents, Tiney and Essie Alford. He is survived by his loving wife of 64 years, LaDonna Alford of Hull; children, Rhonda Maxwell of Nederland, Rudy Alford and wife Marcie of Hull, Rita Rudolph and husband Mark of Huffman; grandchildren, Casey Maxwell and wife Heather of Nederland, Kristin Maxwell of Nederland, Angie Alford of Houston, Aaron Alford and wife Lauri of Lubbock, Kelsey Rudolph of Huffman, Bret Rudolph of Huffman; great grandchildren, Kaylee Greer of Nederland, Katelyn Maxwell of Nederland, Savannah Maxwell of Nederland and Owen Alford of Lubbock. His family will receive friends at Faith and Family Funeral Services on Friday June 28, 2013 from 5:00 p.m. until 9:00 p.m. A graveside service is scheduled for 10:00 a.m. Saturday June 29, 2013 at Guedry Cemetery in Batson…. AAFA NOTES: SSDI records confirm the birth and death dates of Winfred T. Alford (SS# issued in TX), last residence not listed. We included the obituary of his mother, Essie B. Fults Alford, in Texas Obituaries. 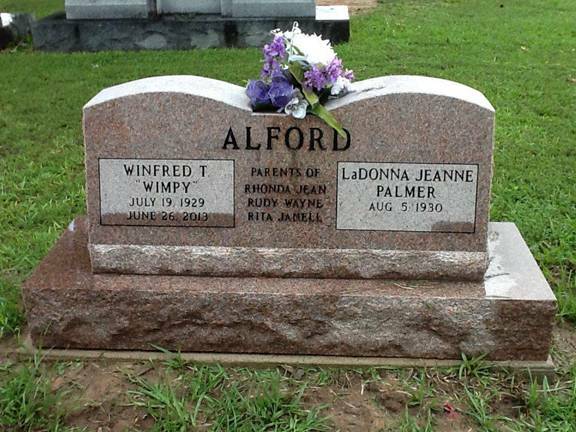 Winfred’s wife, LaDonna Alford, reports that Winfred’s middle initial is his full middle name. His lineage: Winfred T. “Wimpy” 1929 TX1, Tiney Conway 1904 TX2, Jessie Claude 1876 LA3, Wilkins Smith 1850 AL4, Almon B. 1810 GA5, Owen Wilkins 1780 VA6, William 1741 VA7, Salvator 1716 VA8.